The third day of Texas Instruments' T^3 2014 International Conference is wrapping up here in Las Vegas, and it has easily reached the high bar set last year in Philadelphia. We have reported thus far on the the conference welcome, the first full day of sessions, and yesterday's special talk about the Science Behind Hollywood program. The second day of the conference was filled with many more fascinating plenary sessions, and the third half-day was split between a series of parallel power sessions and the closing session. I learned a great deal at the conference, had a good time teaching, and it will soon be time to sign up for T^3 2015 in Fort Worth, Texas. I also learned a number of other interesting facts that I'll be sharing with you in the next few days, including more information about the much-maligned TI-84+CSE OS 4.2. Without further ado, the events of the past two days. 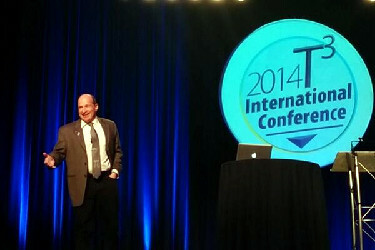 Saturday, March 8th, was entirely filled with a series of fascinating plenary sessions. The conference began at the early hour at 8am, and I chose to attend "The TI-84 Plus C Silver Edition Graphing Calculator: Let's Take Advantage of the Color and Free Apps" by Beth Smith. Ms. Smith spoke about some of the things you can do with the color features, and touched on the use of the Transform and Inequality Graphing apps. Although I was familiar with many of the feature, I enjoyed seeing the calculator from a teacher standpoint, and I got to talk with her about missing TI-84+CSE applications and what the community could do to help resolve the disparity. The next two sessions were related to TI-Nspire Lua, first "Lua, the Next Step" with Fred Fotsch, and then "Advanced Lua Scripting in TI-Nspire Technology" with the community's own Adrien Bertrand of TI-Planet. Both talks were highly informative, and I hope they'll inspire me to play with Lua some more in the future, both for LuaZM and the TI-Nspire. Right after the Lua sessions, we had to run to "STEM Behind Hollywood: Adventure, Drama, and Mystery in Your Classroom" which we have already covered in detail here. The afternoon was a little quieter, with lunch, a few more TI-84 Plus C Silver Edition sessions that I dropped into to hear more teacher perspectives, and a great chat with the obliging Dale Philbrick and his colleague Andrew on TI-84+CSE OS 4.2, the TI-Nspire and TI-Nspire Apps for iPad, and TI's future efforts to make the activities available on the devices more encompassing of teachers and students of all ages. I'll be sharing some of that information here in the next few days. The last session of the evening was "Code Red: Using the TI Light Sensor as a Remote Decoder" with Ian Galloway, which let us explore light bulb power computation, remote control IR protocol reverse-engineering, and more with TI-Nspires and light sensors. The final morning of T^3 2014 has been split between a Power Session and the Closing Session. I chose to go to a power session taught by Zalman Usiskin, described as a vocal proponent of CAS tools, entitled "Ethics of CAS". He had some great perspectives on the advantages and potential disadvantages of using CASes in the classroom. I enjoyed his talk, and found it quite compelling (and he even complimented me on my tie!). The closing session was sandwiched by words from Gayle Mujica and Peter Balyta, and starred Dr. David Salzburg, the science consultant on the CBS sitcom "The Big Bang Theory". He gave a spirited talk about his experiences working with the writers of the show, making sure that all of the science in the show is as accurate as possible. I found this particularly interesting in terms of something Dr. Schlozman said yesterday: people learn science from what they watch on TV, whether they realize it or not, so it's important that they're getting correct information. The conference was edifying and a great teaching, learning, and networking opportunity. Soon it shall be time to fly back home and leave Sin City behind, and look forward to T^3 2015 in Fort Worth. I hope you'll all join me next year at the conference, in person or in spirit. © Copyright 2000-2019 Cemetech & Christopher Mitchell :: Page Execution Time: 0.082509 seconds.